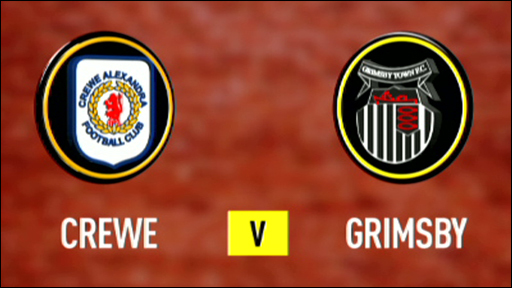 Grimsby remain four points adrift of safety at the bottom of League Two after being outfought by Crewe. The Alex led when Joel Grant teed up Bryan Moore to fire home from 12 yards. Jean-Louis Akpa Akpro found the corner of the net to level before Moore set up Grant to restore the lead and Dean Sinclair made it 2-2 from close range. Ashley Westwood's stunner restored the lead and Alex had Carl Martin dismissed for a late challenge before Clayton Donaldson's solo effort sealed the win. "I don't know what he [Carl Martin] did to get sent off, I didn't watch. I was still raging at the fact that he chose to run with the ball when I told him not to. "Until I can trust him to do as he's told, he won't figure again. "Whatever ban he gets will be music to my ears." 90:00+4:17 The final whistle is blown by the referee. 90:00+2:47 Unfair challenge on Clayton Donaldson by Dean Sinclair results in a free kick. Shot comes in from Steven Schumacher from the free kick, blocked by Paul Linwood. 90:00+0:55 Assist on the goal came from James Bailey. 90:00+0:55 GOAL - Clayton Donaldson:Crewe 4 - 2 Grimsby A goal is scored by Clayton Donaldson from deep inside the penalty box to the bottom left corner of the goal. Crewe 4-2 Grimsby. 90:00+0:37 Nick Hegarty sends in a cross, James Bailey manages to make a clearance. 89:03 Unfair challenge on Clayton Donaldson by Joe Widdowson results in a free kick. John Brayford takes the direct free kick. 87:38 Daniel O'Donnell restarts play with the free kick. 87:38 Substitution Joel Grant goes off and Steven Schumacher comes on. 87:38 Free kick awarded for a foul by Dean Sinclair on James Bailey. 86:59 The ball is delivered by Michael Leary, save by Steve Phillips. 85:09 Robert Atkinson takes the free kick. 85:09 Sent off Carl Martin is sent off. 84:49 Carl Martin concedes a free kick for a foul on Michael Leary. 83:59 Unfair challenge on Carl Martin by Adam Proudlock results in a free kick. Steve Phillips takes the free kick. 83:34 Inswinging corner taken right-footed by Nick Hegarty, clearance made by Carl Martin. 82:54 Unfair challenge on Byron Moore by Joe Widdowson results in a free kick. Free kick taken by John Brayford. 80:08 Shaun Miller is caught offside. Paul Linwood restarts play with the free kick. 78:48 Centre by Byron Moore, save by Nick Colgan. 77:46 Close range effort by Clayton Donaldson goes wide of the left-hand upright. 74:53 A cross is delivered by Michael Leary, Lee Peacock takes a shot. Save by Steve Phillips. 74:35 Jean-Louis Akpa Akpro takes a shot. Save made by Steve Phillips. 74:24 Adam Proudlock produces a cross. 72:35 Outswinging corner taken from the right by-line by Ashley Westwood, Lee Peacock makes a clearance. 72:30 A cross is delivered by John Brayford, Joe Widdowson gets a block in. 71:02 Free kick taken by Ashley Westwood. Shot from 25 yards by Ashley Westwood. Blocked by Paul Linwood. 71:02 Booking The referee cautions Paul Linwood for unsporting behaviour. 70:47 Paul Linwood gives away a free kick for an unfair challenge on Clayton Donaldson. 69:55 Foul by Peter Bore on Joel Grant, free kick awarded. The free kick is delivered right-footed by Ashley Westwood from left channel, Lee Peacock makes a clearance. 69:30 Daniel O'Donnell fouled by Jean-Louis Akpa Akpro, the ref awards a free kick. Steve Phillips restarts play with the free kick. 69:17 A cross is delivered by Adam Proudlock, clearance made by Daniel O'Donnell. 68:10 Corner from the right by-line taken by Nick Hegarty, Close range header by Paul Linwood goes over the crossbar. 67:44 Nick Hegarty crosses the ball, Lee Peacock takes a shot. Save by Steve Phillips. 67:02 Clayton Donaldson is ruled offside. Free kick taken by Nick Colgan. 66:24 Free kick awarded for an unfair challenge on Ashley Westwood by Michael Leary. Direct free kick taken by Daniel O'Donnell. 65:15 Substitution Adam Proudlock joins the action as a substitute, replacing Michael Coulson. 65:15 Substitution Michael Leary joins the action as a substitute, replacing Peter Sweeney. 64:50 Peter Bore crosses the ball, clearance made by John Brayford. 61:53 Mat Mitchel-King takes the free kick. 61:53 Booking Peter Sweeney receives a caution for unsporting behaviour. 61:33 Free kick awarded for an unfair challenge on James Bailey by Peter Sweeney. 60:38 Effort from outside the penalty box by Peter Bore goes wide left of the goal. 59:42 The referee blows for offside against Clayton Donaldson. Nick Colgan takes the free kick. 59:19 John Brayford takes a shot from 25 yards. Paul Linwood gets a block in. 58:43 Ashley Westwood takes the outswinging corner, clearance made by Peter Bore. 58:30 The ball is sent over by Joel Grant, save by Nick Colgan. 57:59 Lee Peacock challenges Shaun Miller unfairly and gives away a free kick. Direct free kick taken by Daniel O'Donnell. 56:46 Joe Widdowson fouled by Byron Moore, the ref awards a free kick. Direct free kick taken by Nick Colgan. 56:07 Effort from the edge of the penalty box by Shaun Miller goes wide of the right-hand upright. 55:21 Shaun Miller takes a shot from inside the six-yard box clearing the crossbar. 54:09 The assist for the goal came from Clayton Donaldson. 54:09 GOAL - Ashley Westwood:Crewe 3 - 2 Grimsby Ashley Westwood finds the back of the net with a brilliant goal from long range to the top right corner of the goal. Crewe 3-2 Grimsby. 51:26 Inswinging corner taken right-footed by Ashley Westwood, Michael Coulson makes a clearance. 50:29 John Brayford takes a shot. Save made by Nick Colgan. 48:49 The ball is swung over by Jean-Louis Akpa Akpro, Daniel O'Donnell makes a clearance. 47:24 Peter Sweeney delivers the ball, clearance made by John Brayford. 45:44 Unfair challenge on Daniel O'Donnell by Jean-Louis Akpa Akpro results in a free kick. Steve Phillips takes the free kick. 45:00+3:01 The referee blows for half time. 45:00+2:42 Nick Hegarty concedes a free kick for a foul on John Brayford. John Brayford takes the direct free kick. 43:26 The ball is delivered by Michael Coulson, Daniel O'Donnell makes a clearance. 42:55 Unfair challenge on Peter Sweeney by Ashley Westwood results in a free kick. Direct free kick taken by Paul Linwood. 41:39 Substitution Matt Tootle leaves the field to be replaced by Carl Martin. 40:35 GOAL - Dean Sinclair:Crewe 2 - 2 Grimsby Dean Sinclair gets on the score sheet with a goal from close range low into the middle of the goal. Crewe 2-2 Grimsby. 40:11 Jean-Louis Akpa Akpro delivers the ball. 38:57 The referee blows for offside. Steve Phillips takes the free kick. 37:25 Substitution Nick Hegarty replaces Jamie Devitt. 34:02 The assist for the goal came from Byron Moore. 34:02 GOAL - Joel Grant:Crewe 2 - 1 Grimsby Joel Grant gets on the score sheet with a goal from inside the box to the bottom left corner of the goal. Crewe 2-1 Grimsby. 31:56 The assist for the goal came from Peter Sweeney. 31:56 GOAL - Jean-Louis Akpa Akpro:Crewe 1 - 1 Grimsby Jean-Louis Akpa Akpro gets on the score sheet with a goal from inside the area to the bottom right corner of the goal. Crewe 1-1 Grimsby. 28:54 Joel Grant provided the assist for the goal. 28:54 GOAL - Byron Moore:Crewe 1 - 0 Grimsby Byron Moore finds the back of the net with a goal from inside the six-yard box to the bottom right corner of the goal. Crewe 1-0 Grimsby. 28:26 Byron Moore takes a shot. Save by Nick Colgan. 28:15 The ball is crossed by John Brayford, Paul Linwood makes a clearance. 26:47 Ashley Westwood takes a outswinging corner to the near post, Mat Mitchel-King takes a shot. Comfortable save by Nick Colgan. 26:30 Shaun Miller takes a shot. Save made by Nick Colgan. 25:54 Foul by Robert Atkinson on Clayton Donaldson, free kick awarded. Free kick crossed right-footed by Ashley Westwood from right wing, Jean-Louis Akpa Akpro manages to make a clearance. 25:14 Byron Moore takes a shot. Robert Atkinson gets a block in. 24:34 Jean-Louis Akpa Akpro handles the ball and concedes a free kick. Steve Phillips restarts play with the free kick. 24:18 Jean-Louis Akpa Akpro crosses the ball, clearance by John Brayford. 23:26 James Bailey sends in a cross, Paul Linwood makes a clearance. 22:41 Peter Sweeney produces a cross, save by Steve Phillips. 21:45 Handball decision goes against Lee Peacock. Indirect free kick taken by Steve Phillips. 19:19 Shaun Miller takes a shot. Save by Nick Colgan. 19:07 Byron Moore delivers the ball, clearance made by Robert Atkinson. 18:08 Dean Sinclair challenges Ashley Westwood unfairly and gives away a free kick. Direct free kick taken by James Bailey. 16:44 Mat Mitchel-King concedes a free kick for a foul on Robert Atkinson. Nick Colgan restarts play with the free kick. 16:01 Ashley Westwood decides to take the corner short. 15:55 The ball is swung over by Shaun Miller, blocked by Peter Bore. 15:01 Peter Sweeney takes the inswinging corner, John Brayford makes a clearance. 14:48 Jamie Devitt takes a shot. Blocked by John Brayford. 13:39 Shot from just outside the box by Byron Moore misses to the left of the target. 13:11 Matt Tootle crosses the ball, Paul Linwood manages to make a clearance. 11:43 Unfair challenge on Paul Linwood by Shaun Miller results in a free kick. Joe Widdowson takes the free kick. 11:06 Shaun Miller has an effort at goal from outside the box which goes wide right of the goal. 10:37 Short corner worked by Ashley Westwood. 10:17 Shaun Miller takes a shot. Nick Colgan makes a save. 9:22 Effort from long range by Jamie Devitt goes wide right of the target. 6:18 Clayton Donaldson takes a shot. Nick Colgan makes a save. Ashley Westwood takes a shot. Robert Atkinson gets a block in. 4:42 Jean-Louis Akpa Akpro is adjudged to have handled the ball. Indirect free kick taken by Steve Phillips. 2:13 Jamie Devitt takes the inswinging corner, Foul by Paul Linwood on Daniel O'Donnell, free kick awarded. Free kick taken by Steve Phillips. 0:59 The ball is swung over by Joel Grant, clearance by Joe Widdowson. 0:23 The ball is sent over by Lee Peacock.